A HAPPY & ENERGETIC PUPPY: 5- 6 months old / Currently 29 lbs. Mostly Mutts adoption center is open Mon-Sat. 11-4pm. Some of us are in foster homes so please call 770-272-6888 1st to find out if I’m available to meet during the week. Hi! I’m Flip – a playful, energetic and happy puppy who is ready to steal your heart! I absolutely love toys and wear the cutest smile while carrying them around with me. After all, a puppy should be prepared to play at a moment’s notice, right? With my toy in my mouth, I’ll be ready! 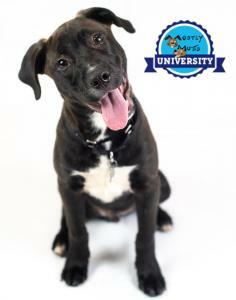 I just enrolled in the Mostly Mutts University training program and have already learned the ‘sit’ command and I’m eager to learn even more! I take treats gently which makes my training fun for both me and my trainer. The leash is pretty new to me, and – a typical puppy - I do some pulling and some jumping, so I will need your guidance to polish my leash manners. Likewise, my potty habits are a work in progress, as I have had some accidents on the shelter schedule. I am getting the hang of my potty training though, so just continue to be consistent with me so I can master those skills. I’ve met some other dogs while at MM’s and enjoy playing, so if you have a nice doggie at home who would like to play, let’s meet to see if we can be friends. Because I am a high energy lets go kind of puppy, I’m looking for a family that will be very active with me as I grow up! I met a 10 and 7-year-old at the MM facility and liked them! I was super excited so a bit jumpy, etc. I’m sure I’ll learn and settle some once I know I’m home furever, though no very small children would be best, so I don’t bump them over with my energetic play, let’s meet! Energy level: 7-9. I'm current on vaccinations, micro-chipped, neutered, and my adoption fee is $299.00 which also includes an engraved name tag, Martingale collar and leash.